Monument Valley is a region of the Colorado Plateau characterized by a cluster of vast sandstone buttes, the largest reaching 1000ft above the valley floor. Kick off your visit on the 25th (Sat): take in the dramatic natural features at Monument Valley Navajo Tribal Park, then look for gifts at Monument Valley Navajo Market, and then hit the best photo ops around with an inspiring photography tour. To see where to stay, traveler tips, photos, and tourist information, read our Monument Valley route builder tool . Washington DC to Monument Valley is an approximately 11.5-hour combination of flight and car. You can also drive. The time zone difference moving from Eastern Standard Time (EST) to Mountain Standard Time (MST) is minus 2 hours. Expect a bit cooler evenings in Monument Valley when traveling from Washington DC in May, with lows around 44°F. Finish your sightseeing early on the 25th (Sat) to allow enough time to travel to Lake Powell. Start off your visit on the 26th (Sun): trek along Alstrom Point and then trek along Rainbow Bridge Trail. To find reviews, maps, ratings, and more tourist information, read Lake Powell online travel route planner . Traveling by car from Monument Valley to Lake Powell takes 7 hours. Traveling from Monument Valley in May, plan for a bit warmer nights in Lake Powell, with lows around 55°F. Cap off your sightseeing on the 26th (Sun) early enough to travel to Bryce Canyon National Park. Kick off your visit on the 27th (Mon): explore the striking landscape of Peek-A-Boo Loop. Here are some ideas for day two: get great views at Inspiration Point, then take some stellar pictures from Paria View, then hike along Navajo Loop Trail, and finally hike along Navajo/Queens Garden Loop. To see more things to do, ratings, maps, and more tourist information, go to the Bryce Canyon National Park trip maker website . You can drive from Lake Powell to Bryce Canyon National Park in 6 hours. While traveling from Lake Powell, expect a bit cooler days and cooler nights in Bryce Canyon National Park, ranging from highs of 63°F to lows of 31°F. Finish your sightseeing early on the 28th (Tue) to allow enough time to drive to Death Valley National Park. Kick off your visit on the 29th (Wed): hike along Wildrose Peak Trail and then take some stellar pictures from Dante's View. Discover how to plan a Death Valley National Park trip in just a few steps with Inspirock's itinerary builder. Drive from Bryce Canyon National Park to Death Valley National Park in 6.5 hours. Alternatively, you can do a combination of car and bus; or do a combination of car, flight, and bus. You'll gain 1 hour traveling from Bryce Canyon National Park to Death Valley National Park due to the time zone difference. While traveling from Bryce Canyon National Park, expect somewhat warmer days and much hotter nights in Death Valley National Park, ranging from highs of 83°F to lows of 55°F. Wrap up your sightseeing on the 29th (Wed) to allow time to drive to Mammoth Lakes. Mammoth Lakes is a town in Mono County, California, the county's only incorporated community. On the 30th (Thu), get great views at Minaret Vista, get engrossed in the history at Mammoth Museum at the Hayden Cabin, and then explore the activities along McLeod Lake. To find traveler tips, more things to do, other places to visit, and tourist information, read Mammoth Lakes journey website . You can drive from Death Valley National Park to Mammoth Lakes in 3.5 hours. Another option is to do a combination of car and bus. Expect a bit cooler weather when traveling from Death Valley National Park in May: highs in Mammoth Lakes hover around 65°F, while lows dip to 34°F. Finish up your sightseeing early on the 30th (Thu) so you can catcht the bus to Yosemite National Park. 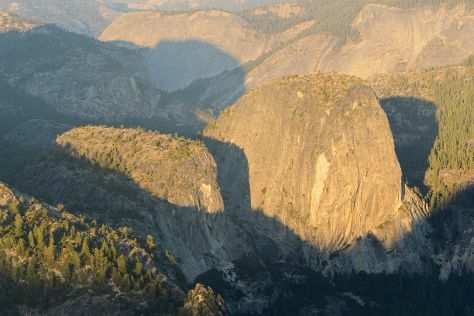 On the 31st (Fri), admire the sheer force of Yosemite Falls, examine the collection at Yosemite Museum Gallery, take in the dramatic scenery at Vernal Fall, then get answers to all your questions at Yosemite Conservation Heritage Center, and finally explore the striking landscape at Glacier Point. Get ready for a full day of sightseeing on the 1st (Sat): don't miss a visit to Olmsted Point, then get great views at Tunnel View, and then walk around Mariposa Grove of Giant Sequoias. To find where to stay, ratings, photos, and more tourist information, you can read our Yosemite National Park sightseeing planner . Take a bus from Mammoth Lakes to Yosemite National Park in 1.5 hours. Expect a daytime high around 65°F in May, and nighttime lows around 34°F. Cap off your sightseeing on the 1st (Sat) early enough to go by car to San Francisco. San Francisco is known for nature, museums, nightlife, shopping, and childrens museums. Your plan includes some of its best attractions: snap pictures at Golden Gate Bridge, explore and take pictures at Golden Gate Park, engage your brain at Exploratorium, and admire the natural beauty at Japanese Tea Garden. 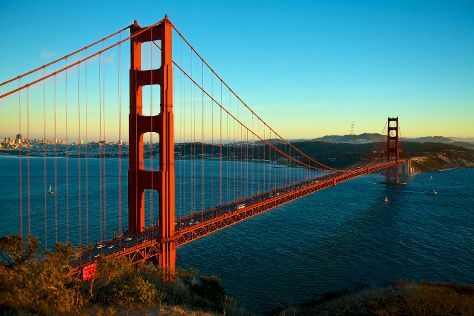 For more things to do, reviews, photos, and other tourist information, go to the San Francisco trip planner. You can drive from Yosemite National Park to San Francisco in 4 hours. Other options are to do a combination of car and flight; or do a combination of bus and flight. When traveling from Yosemite National Park in June, plan for a bit cooler days and a bit warmer nights in San Francisco: temperatures range from 71°F by day to 55°F at night. Wrap up your sightseeing on the 4th (Tue) early enough to travel to Joshua Tree National Park. Kick off your visit on the 5th (Wed): take in the dramatic natural features at Wonderland of Rocks, then pause for some photo ops at Johnny Lang Grave, and then take in the awesome beauty at Eureka Peak. To see other places to visit, maps, ratings, and tourist information, refer to the Joshua Tree National Park trip itinerary maker site . Traveling by combination of flight and car from San Francisco to Joshua Tree National Park takes 4.5 hours. Alternatively, you can drive; or do a combination of bus and taxi. Traveling from San Francisco in June, you will find days in Joshua Tree National Park are much warmer (102°F), and nights are a bit warmer (73°F). Cap off your sightseeing on the 5th (Wed) early enough to go by car to San Diego. San Diego is known for museums, zoos & aquariums, beaches, parks, and historic sites. Your plan includes some of its best attractions: stroll through San Diego Zoo, find something for the whole family at SeaWorld San Diego, let the kids burn off some steam at Balboa Park, and pause for some photo ops at Cabrillo National Monument. To find where to stay, other places to visit, more things to do, and more tourist information, you can read our San Diego day trip tool . Traveling by car from Joshua Tree National Park to San Diego takes 4 hours. Alternatively, you can do a combination of taxi and bus; or do a combination of taxi, bus, and train. While traveling from Joshua Tree National Park, expect cooler days and slightly colder nights in San Diego, ranging from highs of 73°F to lows of 64°F. Wrap up your sightseeing by early afternoon on the 9th (Sun) to allow time for travel back home.